Palm trees can be tricky. They are difficult to maintain, they can host several different unwanted species including roaches, and last but not least, they are everywhere in the Corpus Christi and Coastal Bend area. We've been maintaining palm trees residentially and commercially for many years now. We know how to get in, trim down to size, and get out. Make sure to contact us about keeping yours in shape all year long. We also offer group deals for entire streets that have palm trees, usually coordinated through a neighborhood's HOA. It's very important to keep your palm trees trimmed and maintained properly. In South Texas, unkept palm trees can become home to all sorts of vermin including tarantulas and roaches. ​Regular upkeep and maintenance will aid in making sure that there are no insects living in your trees as well as keeping your landscaping and property looking nice. 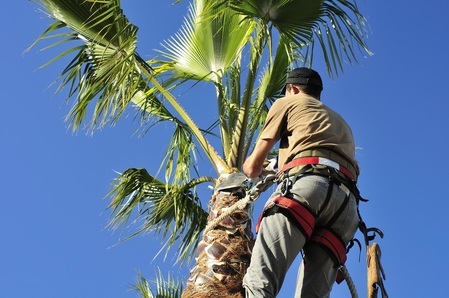 Call us to have you palm trees serviced today! Visit the other pages under the "Services" tab to read more about all of the services that Tree Trimming Corpus Christi has to offer!